Weâ€™re particularly happy to be publishing Elliot Hoggâ€™s first game, Habitat, again. This is the Second Edition of this wonderful title, the rules have been refined to make it much easier to play. 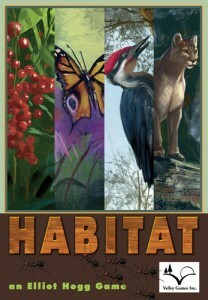 In Habitat, your goal is to attract the most complex and diverse animal life to your portion of the great North Woods. The most vibrant ecosystems are those that have organisms from all levels of life, from the producers up to the dominant predators. Therefore, to win a game of Habitat, a player must create a complete collection of cards ranked 1-8. Cards are stacked in order of rank, from lowest to highest, to form Food Chains. There may be multiple Food Chains and duplicate ranks, but only one card from each rank is needed to win. By contrast, an unsupported chain of cards carries the risk that creatures become hungry, or even begin to starve! When a player has collected the necessary cards and all animals are fed, that player declares a â€œHabitatâ€� and wins the game. Habitat is a game for 2-6 players aged 8 and over.